We have been working with Madrasahs-both with the private madrasas and the government madrasas, since 2004 in sync with our vision to reach out to the most marginalized sections of society to offer quality education to all. 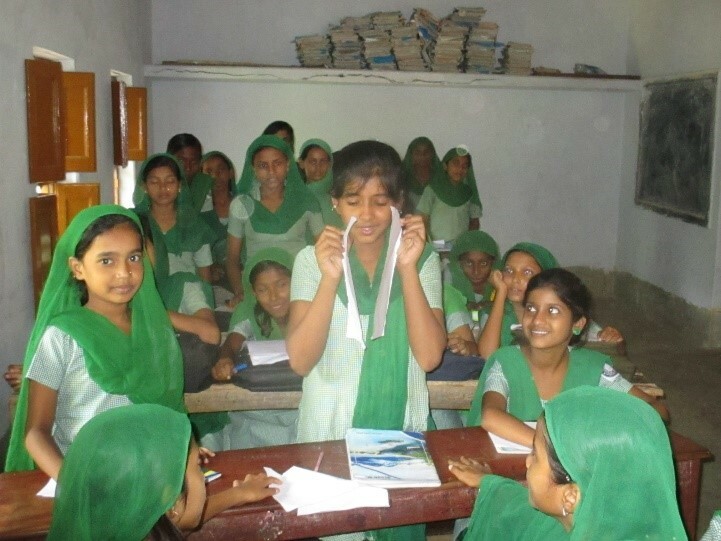 We began work with the Government aided Madrsahs of West Bengal recognizing the crucial role they play in providing access to formal schooling to the Muslim community. As a resource organization, we have taken on several interventions over time with the aim to offer sustained, long term support that would ensure that the Madrasahs are empowered to impart quality education that is relevant and meaningful to children. We try to create models of good practices, which can be taken up by the government system for replication and scaling up. In this light, we created 10 model madrasas in Hooghly districts from 2011-12 and demonstrated pilot interventions for improvement in the learning processes and learning outcomes. Linking the programme’s learning support interventions to the state-wide bridge course programme so that the two can become complementary. We shared successes of our work in the model madrasas in Hooghly and showcased both the student projects and resources developed for learning improvements. Subsequently, the Board invited us to be a technical partner in their plan to roll out a state wide bridge course for students of class 5. As students enter high madrasas with critical conceptual learning gaps in literacy and numeracy, it is essential to provide them with adequate support. This 48-day bridge course was introduced in February last year, in three content areas- Bangla, Maths and English. Vikramshila as the technical partner provided support in the package development of the course, HM orientation, Training of Trainers (TOT) as well as district level trainings, together with support in conducting baseline and end line analysis and on site mentoring support. The pilot was launched in Hooghly, being Vikramshila’s focal district. Simultaneously; surveys were carried out in each madrasa in Hooghly, to prepare a database of its infrastructure, student numbers, and teacher details and so on. We received positive responses from all the HMs of the madrasas, who wished to work with Vikramshila in ITE, Science and learning support programmes. We felt however, that even after the bridge course was completed by the students, given their learning gaps, they would need some scaffolding in attaining the textbook’s expected learning levels, once they enter the classrooms. As such, we continued to provide support to these students after the bridge course was completed by providing the madrasas with simplified texts. Simplified texts were prepared for the lessons of the second and third unit, printed and distributed to all the madrasas, state wide. An orientation of the simplified texts – in terms of its rationale and pedagogy was undertaken with nodal teachers, approximately 120 of them in all the 36 madrasas of Hooghly. The teachers responded very positively after using the material saying that they felt that these simplified texts were very useful in the classroom and wanted similar material from the first unit in the coming year. The ITE intervention continues in the private madrasas, with several interesting projects created by the students. We have gone beyond the ambit of our enrichment of private madrasas and carried the ITE interventions into the government madrasa system. While science, technology and innovation emerged as major drivers of national development globally, we felt that these were critical areas where the madrasas were facing a gap both at the teacher capacity levels as well as student learning levels. With the MHRD focusing to make science and maths learning a joyful and meaningful activity, under its Rashtriya Avishkar Abhiyan, we felt it was the right time to delve into the same domain in madrasas. To nurture a spirit of inquiry, creativity, love for science and maths and effective use of technology among students – a two-pronged intervention was planned –to reach out to teachers and to students, first through capacity building workshops and second through setting up of science corners in the classrooms, to encourage students to move beyond textbooks into hands on simple experiments.